We are the leading manufacturer and supplier of Nail Less Boxes to our valuable clients. 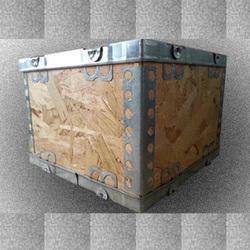 We are instrumental in making Nail less Plywood Boxes available in the market. Available in different sizes, these are made by us in compliance with industrial standards utilizing modern machines & tools. Perfect for use in heavy duty racking application, these are extensively used in diverse area. Our quality analyzers duly test these on certain quality norms before supplying to clients. Nail less Boxes Type A from our side is an ace product. This box assembly usually consists of six parts. The parts are assembled together to made a box unit. It comprises of a bottom, top and a pair of Sides & Ends not joined together and delivered separately. The sides and ends are then interlocked on the base with the help of a High Strength Galvanized Steel to provide the strength to the box. This box is commonly known as the Six Piece type box or sometimes also known as Buckle Box. Nail less Boxes Type B is one of our ace products in the market. This box assembly usually consists of three parts. The parts are assembled together to made a box unit. It has got of a bottom, top and all the four sides joined together with the help of Galvanized steel strip providing it the strength and flexibility to with stand the design load and simplifying the process of box assembly. 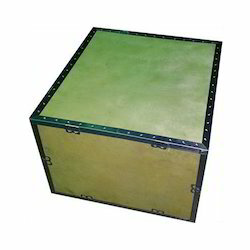 This box is commonly known as Three Piece Type Box sometimes also known as Foldable Box. This Nail less Box Type C assembly usually consists of four parts. As the name indicates quality of both A-B type boxes blended together to form a new class of product foldable-buckle type of assembly. 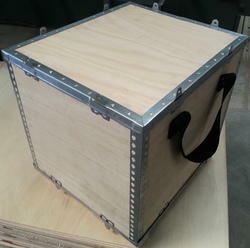 The parts are assembled together to made a box unit. These boxes are strong in nature and are made available to our customers at industry leading rates and as per the set industry standards.